Maybe I should be known as the Rescuer of Rejected Foods. 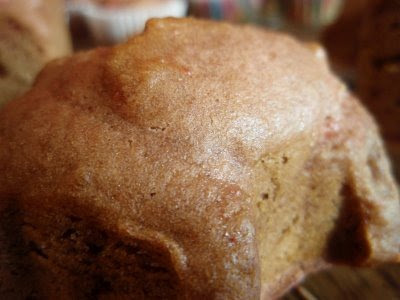 Although I like my applesauce to taste more like apples and less like strawberry, these muffins were undeniably delicious. What's more, the pink of what shall henceforth be known as strapplesauce (not to be confused with scrapplesauce, which would just be disgusting) made them a lovely color. The recipe I used was based on an applesauce cake from the now-defunct blog Ooh you tasty little things. 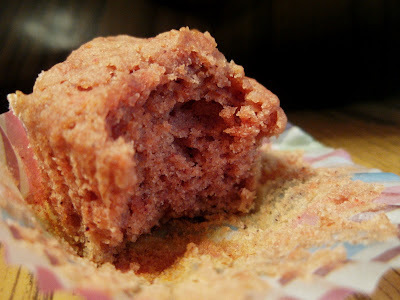 Even with the overwhelming strawberry flavor (or, dare I say, because of it), they were about 424 times better than my previous attempt at applesauce muffins. A few days ago, I came across a marvelous idea on Shari's blog Whisk. She baked her muffins in cookie cutters! I thought it was a stroke of genius, so I tried it out with some of my extra batter. My cookie cutter collection consists of two sheep, two leaves, and five hearts. I was a little concerned about the nooks and crannies in the sheep and leaves, but I gave them a try anyway and was pleasantly surprised. Your idea is chock-full of win, Shari. In a large mixing bowl, mix all ingredients together and stir until smooth. Spoon the thick batter into prepared baking pans, whether mini muffins (I got 48), regular muffins, mini loaves, or cake. Bake for 15 minutes for mini muffins, or around 20-25 minutes for regular muffins. By the way, Happy Halloweenie. Strapplesauce muffins! Gorgeous. And the cookie cutter muffin idea is brilliant! I'm glad you gave it a try! Like you my collection of heart cookie cutters outnumbers the others! We'll be set for Valentine's Day. Your muffins sound delicious! I loved Shari's cookie cutter idea too. It's just a matter of time before I steal it away, too. The muffins, especially the broken hearted one, look delish! And I love the clever name. I have pancakes that I make in the shape of animals- same concept, you just put the shaped thing on the pan and pour the batter inside. I'm the coolest Mom when I do that (which isn't very often). I know what you mean about that flavored applesauce. I do buy the stuff though for my kiddo for his lunches. I guess I'm thinking that a little variation from the regular stuff is good. I love the name! And the idea to bake in cookie cutters - except a lot of my cookie cutters are plastic, so I'll have to make sure not to use those!! Love the name strapplesauce! Baking muffins in cookie cutters is brilliant indeed though most of my cookie cutters are plastic so that wouldn't work so well. I don't know we made peach applesauce this year & it was a real nice change up from regular. It didn't so much mask the apple flavor but accent it. I don't own even one cookie cutter...shame on me! Now I have the excuse I've been needing to buy some since I'm too lazy to roll out cookies that would require cutters. Muffins! Thank you Grace! And also pancakes! Thanks for that idea RecipeGirl. Oh I love a good strapple...wow, nice one Grace. At my grocery store they sell Grapples...apples injected with grape juice. I am with you on the flavored applesauce - it's just messing with nature! Clever use of it though - these are adorable! Cute shapes! I do agree with you that applesauce is a wonderful flavor, to be served or baked all on its own. Heck, I even made an applesauce cake for my dog on his birthday back in May - pictures on my blog. Love that idea of baking them in cookies cutouts. Really like that heart at the end. How on EARTH do you bake this much? Are you an insomniac or what? Cookie cutter muffins!!! Perfect idea!! ... and the strapplesause muffins... hmm, I'm intrigued. That is so cool! I would have never thought of combining applesauce with strawberries, nor baking muffins in cookie cutters! Happy Halloween! Loving the shapes, what a cool use of cookie cutters, and the flavor combinations all in a muffin... you're rocking! What tasty looking muffins - I love the color. It's great that you used cookie cutters. I love the color and the heart shape. Never seen a heart shaped muffin - Neat! 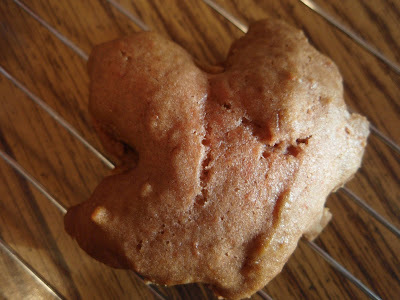 Great idea to bake muffins in cookie cutters! I love it. And the colour is really fun too. Bet they tasted scrumptious. What a great idea! I won't lie, I actually like the "strapplesauce". I'm definitely trying these! Yay for rescuing the strapplesauce ;)! Pink muffins!!! YAY! I'm all for preserving the apple flavor in apple sauce, but I'll definitely make an exception for these ;). She says shyly with her head down, "Uh me and my Mom have been making strapplesauce for years. We make regular apple sauce, strapple sauce and rasple sauce (yup, raspberry). I like them. THey are a marriage of great flavors. So now I can try your idea because I have pints of the stuff. Oh and by the way,t hanks for introducing me to Pushing Daisies, I am now addicted to it. 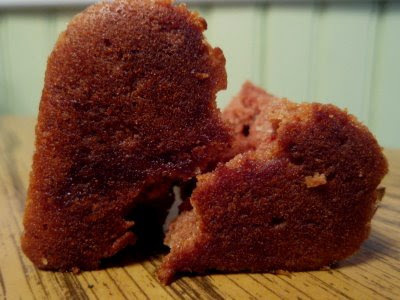 The Strapplesauce muffin turned out better than plain applesauce muffins...mmmmm, that's interesting. It does look good Grace, I'm glad it turned out good for you. Injecting apples with grape juice is way weirder that strapple sauce, that doesn't even sound good! I can't get over "strapplesauce"! I am glad the muffins came great. and what a neat idea baking them in cookie cutters. Ah Grace, You never fail to make me laugh and feel hungry! Strapplesauce?!!! I actually laughed out loud at your 424 times reference. I love that you have sheep shaped cutters! The recipe is great, too! I was surprised to see the cocoa; I bet combined with the cinnamon, these flavors really came out great. YUM! Strapplesauce!! Love it! How about a bunny or cat cookie cutter. The cat would probably look like Garfield after a pan of lasagna. Great idea. Great muffins. Great job. They look really good, I would have never thought of using a cookie cutter for muffin making. Cool idea. What a clever idea to cook muffins in a cooking cutter. That recipe looks so good. I have a surprise for you at my blog! LOL .. strapplesauce sheep, now say that 3X fast. I love the pink tint and the shapes. Too bad most of my cookie cutters are cheap plastic ones. Well, Grace, my little one is on the same page as you. Trying to be fun and different I picked up an 8 pack of the "Strawberry-apple sauce." My daughter looked at me as though I'd lost my mind. So, in my cupboard now sits 7 individual packets of the stuff. Thank you for rescuing them from a life stuck in the pantry! ok, so dumb question, I'm allowed one per year, yes? you use the cookie cutters, but doesn't the batter fall out of the bottom? I used to have baby goats on my dad's farm and wild turkeys, so congrats, I know how fun that stuff is. Cocoa & cinnamon, now that fixes me up so. I like the muffins to look like muffins but I'll still eat your sheep-shaped ones. Oh, I love the cookie cutter idea! I think I'd be in the same boat as you; I don't have many that are the same shape. Muffins sound delicious. I kind of want to call them muffies for some reason. omg cookie cutters! that's ingenius! i saw the first picture and was like how did she make a heart?! I have not tried an applesauce with other flavours in it yet. Using one in a cookie/muffin sounds good! 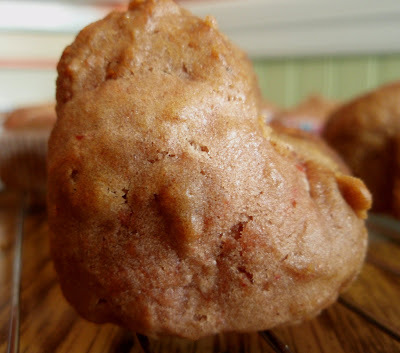 I think plain applesauce is just fine but there are some great flavored ones and these muffins look tasty with that strawberry apple sauce.